Paul Austin enjoys a multifaceted career as orchestral player, chamber musician, soloist, and pedagogue. He holds degrees from the University of Cincinnati College-Conservatory of Music and Tennessee Tech University. Post-graduate training includes the Resident Artist program at the Banff Centre for the Arts as well as being the recipient of a Gilmore Emerging Artist grant from the Kalamazoo Arts Council, allowing him to study in London. 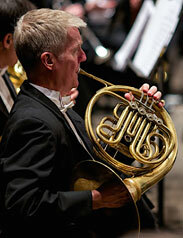 He became a member of the Grand Rapids Symphony horn section in 1999. Paul was instrumental in the drive for the GRS to join ICSOM in 2013 and is proud to have served as their first ICSOM Delegate. In 2015, Paul was elected to ICSOM's Governing Board as a Member-at-Large, and he became ICSOM President in 2017. Paul has been active with the Chamber Music Festival of Saugatuck for many years as Resident Horn Player, Education Director, and Board Member. Currently he is Wind Area Coordinator for Interlochen’s Adult Chamber Music Camp. Paul actively promotes historical instruments and is the author of A Modern Valve Horn Player's Guide to the Natural Horn.